1. Email claims to be from South Trust asking you to confirm your account data by clicking on the link. You will be taken to a spoof login page where your details will be captured by the phishers. 2. 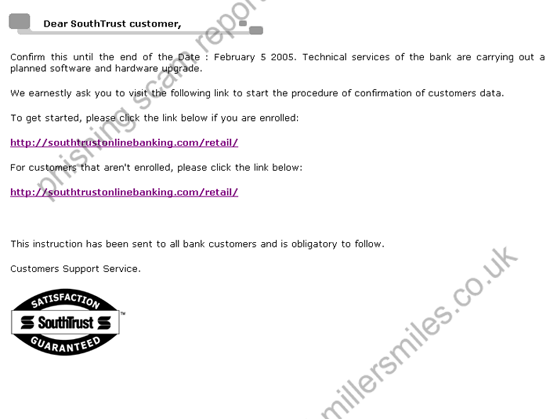 South Trust never send users emails requesting details in this way. 4. Spoof website not online at time of report - URL seems corrupted. However there are likely to other versions of this scam in circulation that link to a working website.
" Confirm this until the end of the Date : February 5 2005. Technical services of the bank are carrying out a planned software and hardware upgrade. "